The Oregon Trail went through the Grande Ronde Valley, so many pioneers started to settle in the area. The Grande Ronde Valley was an important rendezvous point for Native people. In the summer they would harvest, trade, hunt and fish. In 1862 the Native people challenged the pioneer’s right to claim the land, but it ended in bloodshed. La Grande, originally named Brownsville, was first settled in 1861 and later incorporated in 1885. La Grande boomed through the 1860’s and 1870’s with gold miners moving in all along eastern Oregon. This boom helped the homesteaders’ agricultural products and market. In 1884, La Grande’s commercial importance grew as the Oregon Railway and Navigation Company finished the main line through the town. Businesses relocated closer to the flats along the railroad, instead of the original site around the edge of the valley. There was a significant Chinese population in La Grande around the late nineteenth century that had come to work on the railroad and in mines, then stayed on a small business proprietors and farmers. In 1893, a mob of about 200 men burned Chinese owned business and homes and forcibly removed many of the Chinese residents by marching them to the train station. Today La Grande hosts the Eastern Oregon Film Festival as well as other music and arts festivals. The town is known as a popular destination for outdoor enthusiasts. There is hiking, hunting, camping, skiing, and much more. The La Grande area, originally just the Grand Ronde Valley, was first populated by Native people. The Umatilla, Nez Perce, and Cayuse would travel to the area in the summer to trade, fish, hunt, and harvest camas root. As pioneers entered the land, land disputes arose between the Native people and the pioneers. Over time, more and more pioneers settled in the area and La Grande began to grow into a town. Many of the original people who had traveled and settled in La Grande were miners, searching eastern Oregon for gold. Much of the town consisted of these miners and their families, and it began to grow into an agricultural town. With the rise of mining and farming, many Chinese immigrants moved into the town, but were not welcomed with open arms. A mob of 200 men tried to run many of the Chinese immigrants out of town. 50 men were arrested, 10 were charged with arson, but none were found guilty. 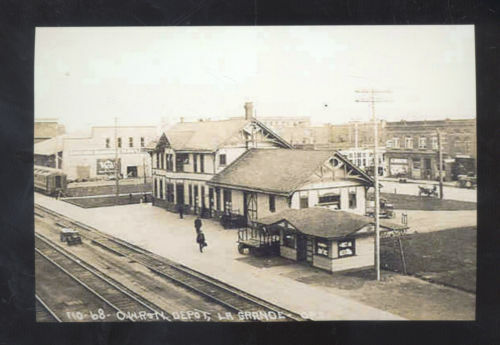 When the railroad was completed in 1884, the town moved closer to the railroad, splitting the town into ‘new’ and ‘old’ La Grande. New La Grande was situated closer to the railroad, along the flats of the valley, while old La Grande stayed behind in the original place along the edge of the valley. Many of the minority business owners, had their businesses located in the old town. La Grande is located along the Central Oregon Railway system, which makes it an ideal location for film exhibition in Eastern Oregon. Its location draws a large movie-going audience, which is actually comparable to individuals that might attend movie theaters within larger cities, such as Portland (1). Moving Picture Weekly. 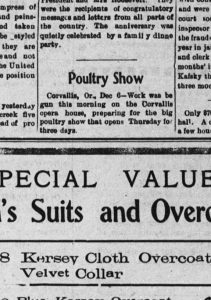 November 24, 1917. p22. From the Sanborn Maps of La Grande, we can see that the city center generally developed in close proximity to the railroad itself. The bulk of La Grande’s main buildings, shops, and restaurants, and movie theaters are all within a few blocks of one another. Further out, there are houses, a handful of schools, and several churches. The multitude of churches in the city underscores the diverse demographics of people that lived within La Grande. Further out from the immediate downtown area are lumber yards, and other areas of industrial activity. From the beginning, La Grande has been an important center of economic activity for Eastern Oregon and the surrounding area. Throughout its history, Union Country has been an economic center for mining, farming, livestock, and lumber production (2). Thanks to its location directly along the railroad, La Grande specifically became an important location for the import and export of goods to and from the region. This economic activity brought with it modest population growth, and a steadily developing downtown area as well. 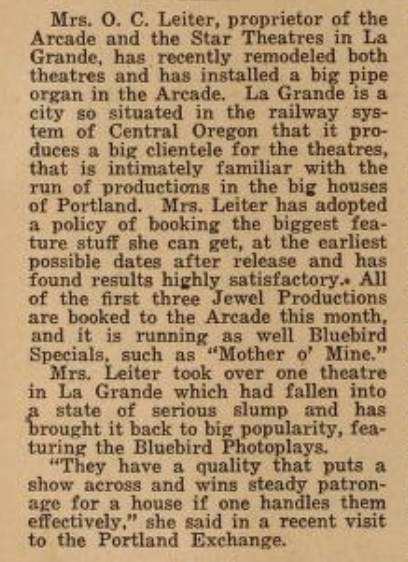 By the early 1900s, La Grande had several movie theaters, multiple restaurants, and several other businesses. 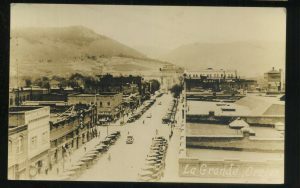 From 1890 to 1930, the population of La Grande increased from 2,583 to 8,050 (3). Despite its modern perception as a relatively rural city compared to other growing areas in Oregon, such as Portland and the Willamette Valley, La Grande in the early 1900s was one of Oregon’s most significant locations of growth, development, and economic activity. La Grande has a history with “rich and diverse” arts and culture. 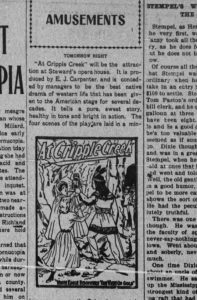 In this particular issue La Grande evening observer published in January 05, 1906, the paper highlights some of their arts and cultural events under the Amusements section. After the build of the railroad section in 1884, the town changed dramatically. The hierarchy of wealth in the valley migrated closer to the railroad and more important businesses developed near the railroad as well. We see a lot of the migrant workers who helped build the railroad use this as a chance to establish their own small businesses in the space that opened up by prior occupiers. 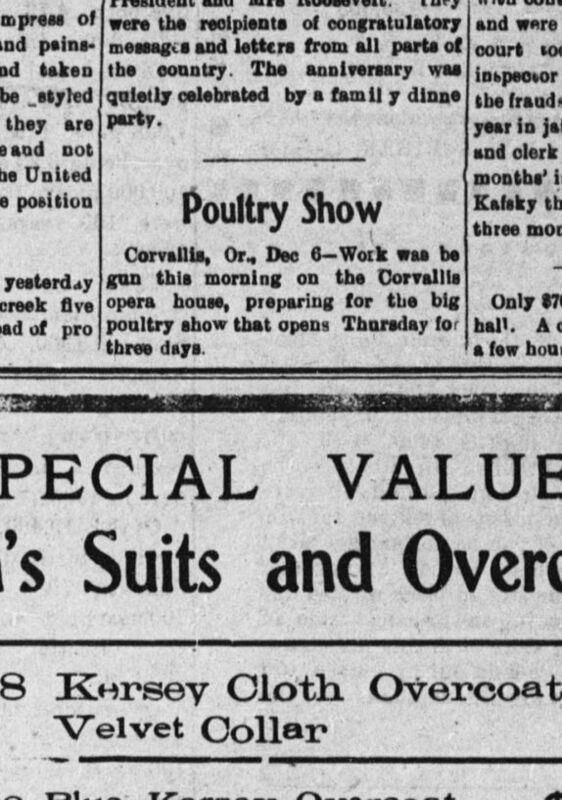 In 1929, La Grande opened a small teacher’s college known as ‘Eastern Oregon Normal School’. It eventually became known as Eastern Oregon University and is a major source of income for the town as many Oregon residents migrated to attend. The world record for oldest college graduate was set at EOU, as Leo Plass, 99 years old, dropped out in 1932 during the great depression and reenrolled to finish his degree in 2011. During the time of the teachers college, the salary earned by graduates who went on to become teacher’s wouldn’t suffice due to the state of the abnormally frail economony. This led many residents to leave and take trade jobs in the mines, and sugar factory around La Grande. 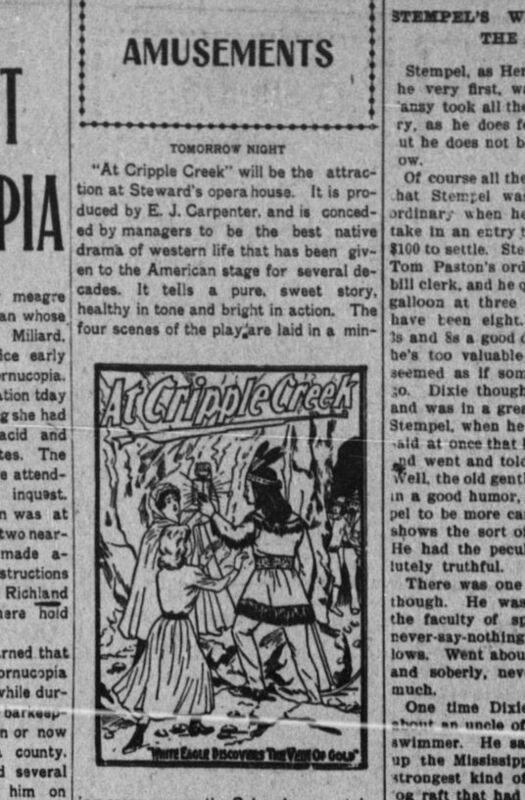 (1) “News Flashes of the Seattle Film World,” Motion Picture Weekly, November 24, 1917: 22. (2) “Union County History.” Oregon Secretary of State, sos.oregon.gov/archives/records/county/Pages/union-history.aspx. (3) Population of Oregon Cities, Counties, and Metropolitan Area 1850-1957. Bureau of Municipal Research and Service, University of Oregon. Information Bulletin No. 106, April 1958. (4) The Oregon Encyclopedia, oregonencyclopedia.org/articles/la_grande/.